In a medium size skillet over medium-high heat, heat 1 tablespoon of butter and cook the onion and garlic until soft, about 3-4 minutes. Remove from the heat and cool. In a mixing bowl, beat the egg, then add the ricotta, nutmeg, lemon zest, salt, pepper, spinach, artichoke hearts, breadcrumbs and the cooled onion and garlic mixture. Add 3/4 cup of the Parmigiano Reggiano cheese. Reserve the filling while you prepare the spring-form pan. Melt the remaining 4 tablespoons butter and brush the entire inside of pan with it. Line one side of the pan at a time with phyllo: Lay one sheet with the short end in the middle of the bottom of the pan. Drape the rest of the sheet up the side of the pan and over the edge, leaving a good amount of overhang. Brush the section on the bottom of the pan with more butter, then repeat with another sheet of phyllo on the unlined half of the pan, overlapping the sheets a bit in the center. Sprinkle the phyllo-lined bottom of the pan with remaining Parmigiano Reggiano cheese and season with some pepper. Turn the pan so that one of the draped sides is facing you and repeat the layering action in the opposite direction, leaving you with lots of overhang on all the sides of the pan. Brush with any remaining butter. With care, transfer the ricotta filling into the phyllo-lined pan; spread it out evenly, from edge to edge, trying not tear the phyllo. Working one at a time, fold each of the draped overhanging phyllo sheets over the top of the filling, pressing in down gently. Brush each folded-over sheet with a little more butter. Let cool for about 5 minutes, remove the outer ring of the pan and serve. Serve warm or at room temperature. In Recipes-list.com we have selected the most viewed recipes from category - uncategorized . Enjoy the best recipes specially selected for you! 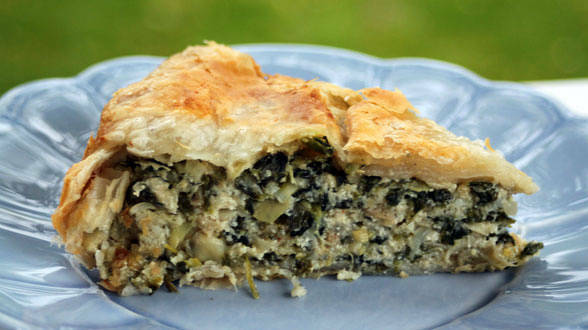 Spinach Artichoke Ricotta Pie is the right choice that will satisfy all your claims.